I've learned a lot about Atlanta architecture since starting tourATLANTA. For instance, the Promenade II building (photo) is one of what was supposed to be three identical buildings, of differing heights, in the Midtown skyline. The other two were not built because of the collapsing economy. Promenade II, completed in 1990, is at Peachtree and 15th Streets. Another point, vastly more important, is that building height doesn't necessarily translate into number of floors. At 691 feet, the Promenade II comes in at only 38 floors. 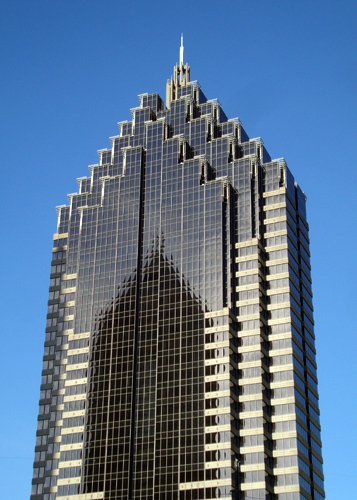 Its fins at the top, dramatically lit at night (time stamp 1:57), make it a distinguished landmark in the Atlanta nighttime skyline...actually, it was built on a diagonal to emphasize its place in the skyline and to give it tenants optimal views of downtown Atlanta. I love this particular photograph for its demonstration of Atlanta truly being a "city of glass"...the building being reflected is its neighbor, One Atlantic Center. Both buildings have former names...Promenade II was once called the AT&T Building and One Atlantic Center was originally known as the IBM Tower. I've always like this one, the steps and the filigree you can see from close by. I like the view of it from Colony Square. I think the steps create an optical illusion. I don't if the architects intended it. From a distance (like driving south on I-85) the steps/saw-teeth appear to angle up. Once your eye sees it that way, it looks radical modern, POMO.